What happens when you are in Minneapolis and someone comes up and KICKS the side of your car. You end up with a LARGE DENT about a size 12 shoe that is left in the quarter panel. Just like the one in this Mercedes. So what do you do? Watch this video to see what happens. So my customer was downtown Minneapolis one evening when some guy comes up to his car and gives a good swift kick right to the left rear quarter panel. Now he has the large dent in his nice Mercedes. Needless to say he was not very happy with this. It’s a good thing he brought the car into us at Excel Dent Removal to have paintless dent removal done to repair this dent. With the paintless dent repair (PDR) method I was able to remove this large dent without having to repaint the car. You will see in the video that the PDR method involves gaining access to the back of the panel to push the dents out from the inside. For this large dent in the Mercedes quarter panel it meant taking out the tail light and exposing the opening behind it. Often with large dents there will be a “crown”. This is what happens when the vehicle gets dented. The metal doesn’t just go inward but has to move somewhere and can cause the metal extrude out. Much like the ripples in the water when a rock is thrown in. You will see in the PDR video that I had to use a special hammer to knock down the crowns to straighten the metal. If you are in Minneapolis and you’ve have a dent you need removed. You can contact me to schedule an appointment for your repair. A customer came by our Blaine Minnesota dent removal shop for an estimate to repair a small dent in the rear hatch of his Mini Cooper. Small dent and dings like these can be repaired in under an hour while you wait. I was able to repair this dent with no visible sign that it was ever there. Time to repair: 30-45 min. What is your most important reason for choosing a paintless dent repair company? We would like to know what you are looking for when choosing a Paintless Dent Removal company. There are many reasons why you should choose an experienced paintless dent repair company. Paintless Dent Repair, also known as PDR, is a learned skill. It can take several years of training and practice for a dent removal technician to make a quality repair. The process used in making PDR repairs involves using special stainless steel rods that gently push the metal back into shape making several very minor pushes to the underside of the metal. Paintless repair professionals do not use suction cups or dry ice to “pop” out the dents. Those methods do not work on normal door dings and dents. They can also do damage to the paint finish of your car. Contact Us if you have any questions or if you are in need of a paintless dent removal company near you. There are a few things you should know before taking your car in for a hail damage estimate. Whether you are taking it to the insurance company or a dent repair shop for the hail dent estimate. First would be to have the exterior of your car clean and dry. This is so that the person looking at your vehicle will not miss any of the hail dents or damage to the panels. If your car is dirty, hail dents and other damage may not be noticed. This will cause a need to supplement the insurance company for the additional dent repairs needed, delaying the time needed for hail damage repair to your car. Second, in what conditions is your vehicle being looked at? If your hail damaged vehicle is being estimated outside in the sun, you will not be able to see all of the hail dents. In order to see all the dents, the car should be in the shade or it would be best to be inside. A proper reflection is also needed to see all the hail dents. 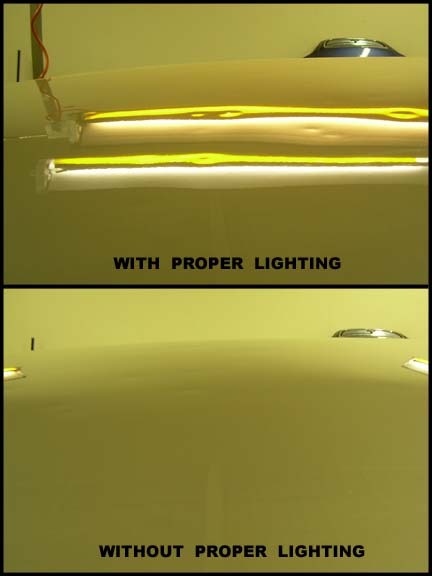 * See the picture below * A proper reflection and lighting will help with the hail damage estimate. Third, be sure to know that the dent repair shop is experienced with hail damage estimating. They should know the “limits” of what can be repaired with paintless dent repair. They should also know what to look for if the vehicle has had other major body repairs. If your car has had previously been repaired and painted with conventional auto body repair, paintless dent repair may not be able to be used on those damaged panels. They should be able to look for damage to the paint from the hail. If the hail dent falls on the edge of a panel, it may have put a stress crack in the paint. That panel then would need to be repainted. Be sure that the insurance company or repair shop explains the estimate to you. You should know what repairs are being done to your vehicle. You can get some great information about paintless dent repair and hail damage repair from the National Alliance of Paintless Dent Repair Technicians. They have a FAQ about Hail Damage and Info About Hail Repair. Here is a great article about Proper Paintless Dent Repair Estimating. It is from Autoinc.org an online magazine published for the ASA (Automotive Service Association). If you have any questions about your hail damage estimate, we would be happy to help you. We are able to work with your insurance company to be sure that your car is restored to its pre-damaged condition. Contact Us for your Free Hail Estimate.